Lake Nipigon, the Nipigon River and all the smaller satellite lakes and streams that surround and run into Lake Nipigon are famous for being the hottest Brook Trout fishing destination in the Ontario. It’s also home to the official World Record Brook Trout caught by Dr. JW Cook in 1915. Pasha Lake Cabins is located right in the middle of it all. Pasha Lake Cabins is only a 20-minute drive from the public boat launch on Lake Nipigon and the Nipigon Forest Reserve were you will have access via a short hike to some of the best rapids on the Nipigon River. 2013 Show #6: Nippigon Brookies from Mari Romanack on Vimeo. Brook Trout, which is also called the Speckled Trout by most anglers in Ontario, is a fantastic tasting trout with a flavor like no other trout in the world. They are also considered the most prestigious fish to catch by people living in Ontario. Brook Trout can be the most frustrating fish. They like sunny days with high pressure and the weather needs to be stable for a few days. They are so sensitive to weather that they can stop feeding for a week after a low-pressure system has gone through the region. They can also stop feeding 2 days before a low-pressure system comes in. 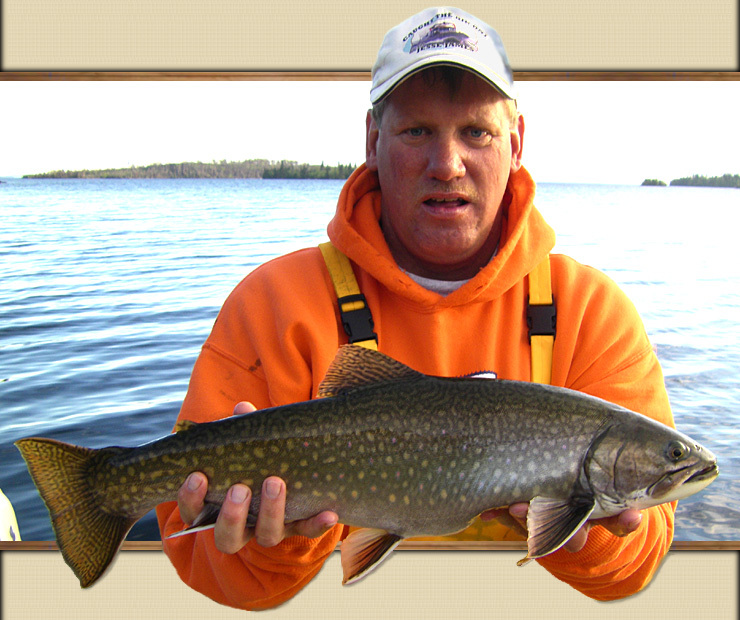 If you came to Ontario for a Brook Trout fishing vacation, Pasha Lake Cabins is a great place to go because if weather has spooked the Brookies, you have great fishing for other species. 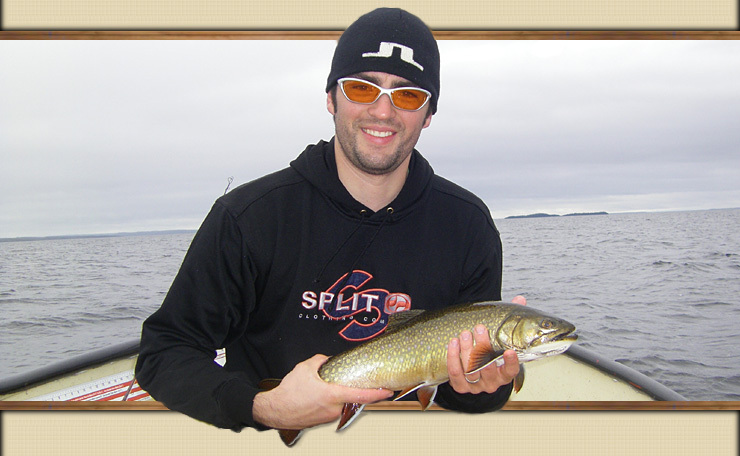 Brook Trout in the 12 to 20-inch range are the most commonly caught size on Lake Nipigon. 10% of the Brook Trout you catch will be 21 to 26 inches and sometimes you may get a monster that’s over 26 inches. A 26-inch Brook Trout is usually around 8 pounds. Most people consider a 3-pound Brook Trout a trophy. It’s very rare for a Brook Trout to be caught over 8 pounds in Lake Nipigon but on occasions Brookies up to 10-pounds are taken. As we said before, Brook Trout are very sensitive to weather but if you do hit the lake on a good day you should bring in between 1 and 12 good size trout. It depends on how well you know the lake and how much experience you have fishing in a lake for trout. Brook Trout are not like Lake Trout. Brook Trout rarely go deeper than 35 feet. They tend to stick close to shore where the shore drops off suddenly or they hang around islands and shoals. Brook Trout do feed on minnows in the lake but they prefer to feed on insects. The best time to get them is just at dusk when the water is dead calm. The Brook Trout come right up to the surface to feed on flies and other bugs. In the spring they will act like bass and hide under logs or fallen trees right along the shore. If there is a stream or river in the area, they will migrate up stream and wait for the May Fly Hatch. Not all streams will hold Brook Trout all year because the water gets too warm. If the source of the stream is a cold spring-fed lake, many smaller trout will migrate up stream to the cooler water. A small stream only has so much food so the bigger Brookies tend to head back to Lake Nipigon in late spring when the stream starts to get warm. In early spring you can catch Brook Trout casting trout spoons, trolling or flyfishing. You can also cast towards shore with countdown Rapalas and pull the lure through logs and other structure that will give the Brookies cover. As the water warms up, the trout go deeper but not as deep as Lake Trout. You can still catch them with downriggers or a 3-way swivel rig. Some anglers will find a deep drop-off and jig for them with small jigs. Usually in the heat of the summer they are down around 25 to 35 feet deep. 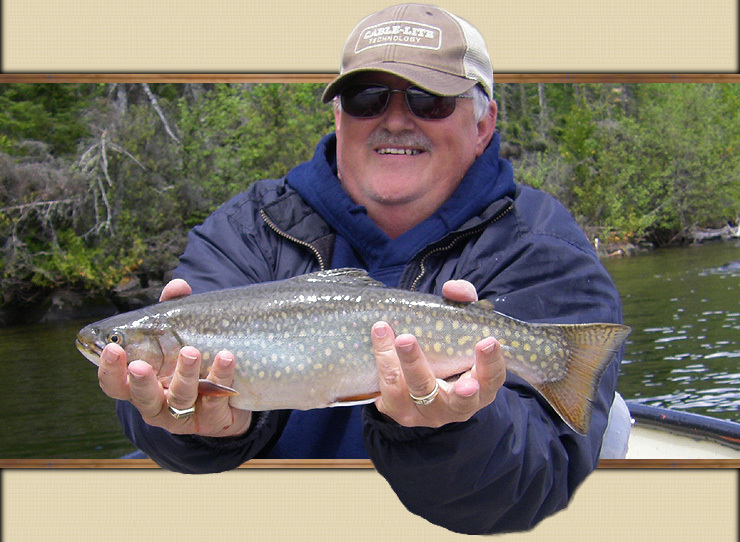 The Nipigon River traditionally produces world class Brook Trout. They are usually what are called Lake Superior Coasters. These Coaster Brook Trout get big and migrate into and out of the river all year. These Coaster Brook Trout have been caught in the 10 to 12-pound range on many occasions. Coaster Brook Trout populations do not exist like they did in the 19th century but the MNR and the Town of Nipigon are actively trying to restore the Coaster Population through habitat restoration and stocking from existing Coaster eggs, which have a unique genetic profile. There are no fishing camps on Lake Nipigon. Vacationing at Pasha Lake Cabins and taking day-trips to Lake Nipigon is the most advantageous plan you can make. If the weather turns bad, you can still have a productive day of fishing on the lakes surrounding Pasha Lake instead of sitting in a hotel room in town waiting for the charter boat to give you the ok. Miserable weather usually means the Walleyes are hitting like crazy.